CinemaCon is in full swing this week, with the massive event happening in Las Vegas. 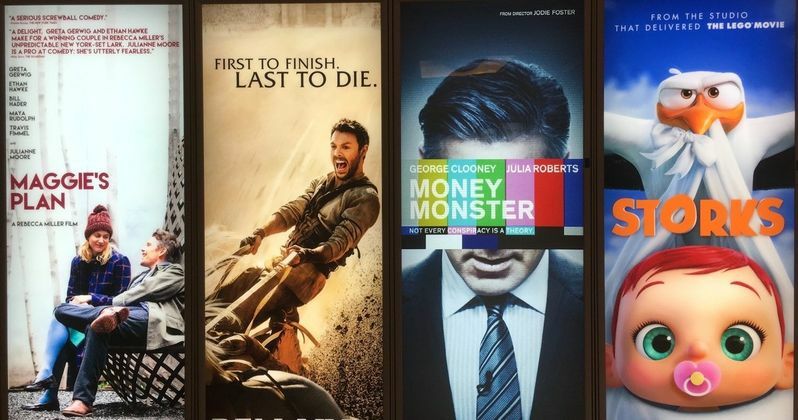 The convention has brought along with it a number of brand new, never-before-seen movie posters for some of this year's biggest blockbuster releases. And there are even a few from 2017 in the mix as well. The convention doesn't officially begin until tomorrow, but we have a man on the scene who was able to get photos of all these exciting new one-sheets and theatrical standees. There are over 60 new images in our CinemaCon gallery. They show off the latest from such big movies as the sci-fi thriller Passengers starring Jennifer Lawrence and Chris Pratt. We also get to see the first official movie poster for Star Trek Beyond, which is in theaters this July. Among the other movies being represented on the Convention floor is The Magnificent Seven remake, also starring Chris Pratt alongside Ethan Hawke and Denzel Washington. And the Ben-Hur remake starring Jack Huston and Morgan Freeman. Mark Wahlberg has two movie on display with Patriots' Day and Deepwater Horizon. CinemaCon will attract upwards of 5,000 motion picture professionals from all facets of the industry. From exhibition and distribution, to the equipment and concession areas, everyone is on hand to celebrate the movie-going experience and the cinema industry. From exclusive Hollywood product presentations highlighting a slate of upcoming films, to must-see premiere feature screenings, to the biggest stars, producers and directors, CinemaCon will help jumpstart the excitement and buzz that surrounds the summer season at the box office. CinemaCon is delighted to have both the International Cinema Technology Association (ICTA) and National Association of Concessionaires (NAC) as its tradeshow partners. CinemaCon is also delighted to have as its official presenting sponsor, The Coca-Cola Company, one of the industry's greatest and highly regarded and respected partners in the world of the movies. One of the biggest events happening at CinemaCon this year is Marvel's special screening of Captain America: Civil War. Full-reviews should immediately follow the screening taking place on April 13. We will have someone visiting CinemaCon for the rest of the convention. We're promised to see a whole lot more from the convention in the next couple of days, so stay tuned for some big reveals and a lot more photos. We'll also have our own review of Captain America: Civil War along with a sneak peek at some of the amazing footage being shown. In the meantime, take a look at all the exciting CinemaCon posters currently on display in the heart of Las Vegas.